I recently saw someone on one of the message boards ask if clownfish will accept a tube anemone as a host. The answer was correctly no, but the person went on to explain that “instead of providing shelter and protection for the clownfish, the tube anemones would immediately kill and eat them!” I see this sort of information repeated in many places, and I wanted to write an article that outlined what is known about the biology of these animals to dispel some of the erroneous information that has been propagated about them in the hobby. I have only seen a couple of books that cover these animals in any detail, and in general they warn of the long and extremely poisonous tentacles of these animals that are capable of killing their tankmates. The fact of the matter is that many popular anemones in the hobby are much more dangerous to the animals in our tanks than are tube anemones. For whatever reason people tend to be better informed and prepared for the potential dangers of clownfish-hosting anemones, and don’t consider them a threat to our tanks. However, a large carpet anemone is far more likely to consume fish (other than the clownfish living within them) and invertebrate tank mates than is a tube anemone. In fact, Jim Fatherree had an article entitled “Killer Carpet” at one point in which he chronicled roughly $300 worth of tankmates that his Stichodactyla haddoni consumed over the previous year. In contrast, tube anemones are generally filter feeders that require regular feedings of live or frozen small foods, and an emphasis should be placed on small feedings made as frequently as time will allow. Minimally, feeding several times per week with some krill or shrimp pellets seems to suffice. Surprisingly, even articles or book sections that correctly describe these animals as filter feeders often follow that with a strong warning about these animals being notorious fish killers. I am not sure where the fish-killer reputation for tube anemones originated, but I don’t see much justification for it – either in the biology of the animals, or the ones that I have kept in my aquaria. The response I read on the message board is not really any different than that I see other places, however, and I’m sure that the person was simply trying to be helpful and repeating the information provided by their favorite reef aquarium text book. Unfortunately, the answers provided by most of these texts are simply not accurate – the chances of a tube anemone eating a healthy fish are actually much lower than any of the clownfish hosting anemones accomplishing the same feat. Despite that however, every article about tube anemones usually includes a warning to the effect of “in view of the risk they pose to other animals, think carefully before introducing them to a well populated aquarium” (Haywood & Wells 1989). In contrast, we rarely see a warning about Stichodactyla or Cryptodendrum, which are two of the most voracious and powerful anemones available in the hobby, being placed into a populated reef aquarium. In fact, to use the same text as an example,Haywood & Wells (1989) say that carpet anemones are “one of the few in the hobby that can sting man…In view of this stinging potential, be very careful when servicing the aquarium” – meanwhile no mention of potential risk to tank mates. So where exactly did the idea arise that tube anemones were such dangerous animals to house in an aquarium? What is the basis for this warning? I simply can’t answer that question. As far as I can tell someone at sometime in our distant reefkeeping past saw one consume a fish and decided that these anemones were deadly fish killers, and every text and column written since that time has repeated that misinformation as fact. I want to discuss these animals in some detail and pose the question: why is it that the tube anemone is always met with such caution while most species of anemone that are true specialist fish predators are not? As I said, I simply don’t know. But in this article I would like to share a variety of factoids about tube anemones to try to dispel some of the myth- information in the hobby about these fascinating animals. First off, you may have noticed that I keep referring to them as “animals” rather than “anemones” unless I specifically say “tube anemone” somewhere above. The reason for this is that despite their appearance, these animals are not anemones at all, and are in fact most closely related to the black corals (of jewelry fame). It is true that they superficially resemble anemones, but the internal differences are so great that they are placed in a different subclass (the Ceriantipatharia) from the true anemones (Brusca & Brucsa 2002). Just to give you an idea of how different being in separate subclasses makes them, true sea anemones, scleractinian (hard) corals, zoanthids and corallimorphs (mushrooms) are all grouped into the same subclass while these animals are not! So why are the cerianthids (the scientific name for tube anemones) not anemones? Aside from some internal structural differences that no one here probably cares about, there are a couple major differences between tube anemones and true anemones that are easy to see. First, they are the only “anemone-like” animal with two distinct whorls of tentacles on the oral disc – they have a batch of short “labial” tentacles which surround the mouth and then a ring of very long tentacles which encompass the outer edge of the oral disk. These long tentacles are used primarily in prey capture and defense, while the shorter labial tentacles are used primarily for prey manipulation and ingestion. In many species the tentacles can be bioluminescent, which is thought to be a visual “startle” defense against fishes that may attack the long feeding tentacles of the animal during their nocturnal expansion. 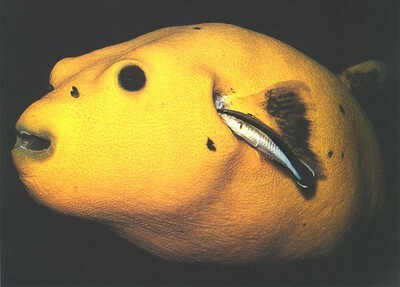 Although some species are seen exposed during the day (and more so at depth), in general thespecies from shallow tropical waters are very stubborn in avoiding light, and rarely come out during daylight hours – even at night, the animals will retract as soon as the edge of a dive light beam passes across them. Their primary predators are not fish, however, but dendronotid nudibranchs which have a sterotypic feeding behavior to latch onto and ingest the feeding tentacles of these animals (e.g., Shaw 1991). These slugs can even be “sucked” into the tube of the “anemone” when it withdraws, but it doesn’t seem fatal to either animal – the slugs can crawl back out of the tube when they have finished their meal, and individual tube anemones have been followed for up to 10 years in areas where they are regularly preyed upon by these nudibranchs. Tube anemones are distinguished from true anemones by their two distinct whorls of tentacles on the oral disk. Here, the short labial tentacles which surround the mouth are in turn surrounded by a ring of partially curled, long feeding tentacles which cover the outer edge of the oral disk. Caption by Robert Toonen and Photos by Julian Sprung and Larry Jackson. 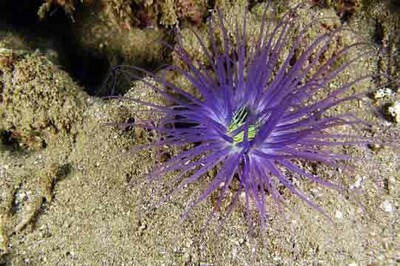 A second key difference between the cerianthids and true anemones is that cerianthids lack the pedal disk and all associated musculature as well as lacking any sphincter muscles – this may sound minor to you, but it means that unlike true anemones, they cannot attach their base to the substrate on which they live. Anyone who has kept a true anemone knows that a happy and healthy animal will be strongly attached to something in the aquarium at all times. Rather than a pedal disk (which true anemones use to hold onto the substrate), cerianthids end in a blunt point (sometimes called the foot) in which a small hole (which allows water to escape the inflated animal during retraction into the tube). More importantly, however, although cerianthids can withdraw into their tube, unlike true anemones they cannot contract the oral disk or withdraw their tentacles (Brusca & Brucsa 2002). That is a pretty major difference. If you’ve ever seen a true anemone feed, you’ve seen it contract the oral disk to bring it’s tentacles closer to the mouth, and when disturbed the tentacles of true anemones are retracted, the oral disk is contracted and a sphincter muscle closes the top of the animal into a ball to protect itself. Cerianthids are unable to do this, and can only retract into their tube to try to protect themselves. 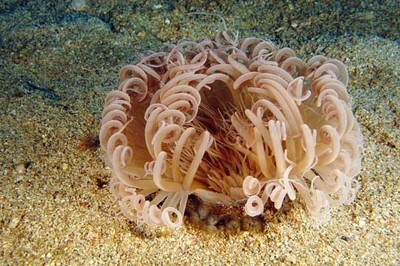 The tube in which these animals live consists of a material almost akin to fiberglass, which is formed by the discharge of special cnidae (the stinging cells of all cnidarians, with nematocysts being the most common kind) called ptychocysts which true anemones do not possess and are also found in only the tube anemones. Depending on the species (there are about 25 world-wide), these tubes can be quite elaborate and some measure >2m in length below the sediment surface! Although there are not many species in this group, it is virtually impossible to identify the species of a tube anemone without killing them and examining some internal structures. Lastly I want to briefly discuss reproduction within this group, but any such discussion is hampered by the fact that there has been precious little research done on this subject. The species that have been studied are protandric hermaphrodites, meaning that small or young individuals are males, and the animal switches to being a female at some point in their lives (possibly triggered by some size or age threshold). Sexual reproduction apparently occurs by the release of gametes into the water column. There are several reports of a tiny tube anemone being found within the body cavity of an adult, but it is unclear whether this is evidence for internal brooding or an aberrant developmental pathway. Likewise, there is some evidence that these animals are capable of reproducing asexually, but to date there is no evidence that this has occurred in an aquarium. Regardless of the exact method of reproduction, the chances that your tube anemone will reproduce in captivity are very slim,indeed. OK, that’s all interesting, but it does nothing to address the question of whether or not these animals are likely to eat fish in an aquarium. The fact is that there are simply no detailed studies of the natural diet of the animals sold in the aquarium trade. So the simple answer is that we don’t really know exactly what they eat. However, there are some studies that examine the distribution and abundance of these animals in the wild (e.g., Shepard et al. 1986, Langton & Robinson 1990, Chang et al. 1992, Holohan et al. 1998). These studies link cerianthids occurrence to high densities of plankton in the water, not to any fish prey. At least one deep-water species appears not to feed at all, but rather to live entirely off symbiotic bacteria in their gut or tube (Jensen 1992). A survey by the National Marine Fisheries Service found that densities of these animals was actually highest in association with polluted waters in which there was significant enrichment and/orresuspension of benthic infauna (Chang et al. 1992). Another study showed that nutrient enrichment in aquaria (resulting in dense phytoplankton) blooms led to significant population increases of Cerianthiopsis americanus (Widbom & Frithsen 1995). The authors attributed the growth of these tube anemones to feeding on detritus and dead phytoplankton ‘raining down’ onto them rather than directly on the phytoplankton themselves. These types of studies suggest that cerianthid anemones are plankton or even detritus feeders in nature, which is quite a stretch from what we should expect of an animal that is supposed to be such an efficient fish killer in an aquarium. Unfortunately, there are simply no detailed studies of the natural diet for any of the tube anemones sold in the hobby. Without such studies, it is difficult to answer exactly what they eat in the wild. The few detailed studies of natural feeding preferences that have been done have concentrated on temperate rather than tropical species. However, none of the tube anemones studied so far appear to feed large mobile prey; some are non-feeding and live entirely off the symbiotic bacteria in their gut or tube, some feed on small zooplankton, and some appear to feed primarily on detritus. In the species studied in most detail, the guts were filled almost entirely with harpacticoid and calanoid copepods (Eleftheriou & Basford 1983, Holohan et al. 1998). Regardless of the specific dietary preferences of the animals, there are simply no studies done (whether on the associations with plankton abundances or the feeding preferences) to date that support the idea that these animals arehighly toxic fish killers. In fact, young Acadian redfish ( Sebastes fasciatus ) appear to use dense patches of tube anemones as juvenile habitat and are found primarily among the tube anemones rather than the surrounding areas (Auster et al. 2003)! The fact remains that all of the clownfish hosting anemones and even some species of corallimorpharians (particularly the Elephant Ear Mushroom, Amplexidiscus enestrafer ) are much more effective predators on fish than are tube anemones. Regardless of this fact, however, the mere mention of “tube anemone” continually elicits a strong warning among hobbyists to avoid them. If we consider the relative risk of adding a tube anemone or an Elephant Ear Mushroom into our tanks, there seems to be little reason for such dire warnings (and I don’t think I’ve ever seen anyone warned against adding a corallimorph of any sort to their tank on the message boards). Does that mean that tube anemones are completely harmless cannot possibly sting or consume a fish or other tank inhabitant? Of course not! What this research does show, however, is that it is much less likely for a tube anemone to harm tank-mates than any of the true anemones to do the same. In other words, contrary to the aquarium lore, the sting and toxins of tube anemones are among the weakest of any anemone-like animal, not the strongest. In fact, even Aiptasia pack much more punch in their sting than do cerianthids. We take some precautions when we add a large anemone to the tank to prevent the sting from causing problems, and you should take similar precautions with a tube anemone. However, the chances of the tube anemone causing a problem for tank-mates should be much lower than the risk of adding a carpet or sebae anemone to the same tank…. I have kept a number of cerianthids in my tanks over the years, and although they have been with a variety of fish all along, I have seen no evidence that they have ever caught anything large in my tank. I wish I could say the same thing about my carpet anemone, which has caught several expensive fish and invertebrate tank-mates over the years! As I said above (and want to re- emphasize to make sure this article is not taken as these animals are completely harmless) it is always possible that a tube anemone may capture a small fish in an aquarium, and I’m sure that the story of the ‘dangerous fish killing tube anemone’ had to start from something untoward happening at some point. However, the point that I am trying to make here is that by all accounts these animals are far less dangerous to fish and invertebrate tank-mates than either true anemones or even some species of corallimorpharian ‘mushrooms’. Given that, the fact that these animals strike fear into the hearts ofreefkeepers appears to be more a result of aquarium urban legend than fact. Especially given that no such response is seen when discussing other species that are potentially much more dangerous. So, now that we’ve looked at the facts and can say that tube anemones are less likely to be a threat to your fish than many other animals that you may already have in your tank, let’s talk about what a tube anemone needs to thrive in captivity. Tube anemones can be an interesting and very attractive addition to a reef tank if the proper conditions exist. However, that last part ‘if proper conditions exist’ is critical, and more often than not, the conditions preferred by tube anemones are not those maintained in our home aquaria. This colorful animal would be a gorgeous addition to any tank with sufficient space and the proper conditions to house a tube anemone. Caption by Robert Toonen and Photos by Julian Sprung and Larry Jackson. First, they are called tube anemones for a reason – they should have a well- developed tube when you purchase them (essentially it looks like fiberglass because it is woven of the threads of special stinging cells as explained above). They can rebuild their tube, but it is stressful and energetically costly, and you can be assured that they will be stressed enough when being moved to a new tank and forced to develop a new burrow, so it is always advisable to aim for one with a good tube to start with. Animals that lack a tube when you buy them have lost it for a reason. 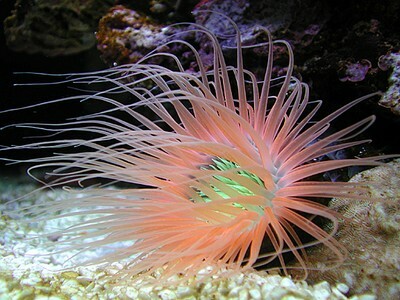 As I explained above, these animals cannot retract into a protective ball like true anemones can, and therefore the tube is the only source of protection that they have. Given that, they do not leave their tubes willingly, and an animal without a tube is a good indication that is has been seriously mistreated somewhere during collection and/or transport. Second, these animals live with their tubes buried deeply in fine sands and muds. If you have a bare-bottom tank, or one with either a thin bed or coarse (rice-grain size or greater) gravel, these animals will not be able to find a spot that suits them and will most likely perish in short order in your aquarium. In the wild, the burrows of large animals can extend a couple of meters, so a sandbed that is only a couple of inches deep is just not going to cut it for these animals. In cases where I am worried about the depth of the sandbed for a tube anemone, I make an artificial burrow for them. Simply cut a section of PVC pipe into which you can stick the animal’s tube and fill the pipe around the tube with sand. If your tank is anything like mine, the PVC is completely covered in coralline algae in no time, and won’t be an eye-sore within a month or so. If you’re really worried about the look of the PVC pipe in your tank, you can pre-coat it by sticking a section of PVC into theback of your tank until it is covered before adding the animal to your aquarium. Regardless of how you choose to do it, the animal will be much happier in the pipe and will probably survive longer than if you try to lay it somewhere inappropriate in your tank. I usually use a tube that is at least as long as the tube anemone itself, preferably closer to 1.5 times as long and as wide as the animal. I then hot-glue a solid base to the bottom of the pipe (a plastic yogurt or coffee lid works pretty well); this will prevent the sand from pouring out around the animal if the tube is disturbed. The animal (still within its tube, of course) is then slid into the pipe until about 4/5 of the body length is within the PVC. Carefully pour sugar-fine or smaller sand (preferably from an established aquarium) around the animal to support the tube until the PVC pipe is filled to the top. At that point, the animal will be securely housed within a deep sand burrow, and you can place the PVC pipe intothe exact spot that you want the tube anemone displayed. Another major consideration is that some species can expand to form a 30cm-or-so sphere of feeding tentacles from the end of the tube (obviously a large portion of a small tank could be covered by the reach of 1ft long tentacles!). Even if your animal is small now, it will hopefully grow, and you need to have the space available to allow it to expand safely (both for the tube anemone and its tank-mates), so you’ll want to make sure it is at least a couple inches away from pump intakes and the like when fully expanded. The third bit of information that you need is that the vast majority of these species are nocturnal – that means that you will likely only see the animal occasionally during the day. Fortunately some individuals do appear periodically during the day or lose their nocturnal habit in captivity, but you shouldn’t expect to see a new tube anemone very often during the day. If they are happy and healthy, they should be primarily coming out to feed after the lights are out. That means that you have to put in an extra effort to check on them during the evenings and make sure that they are fed at this time as well. This can be rewarding in some cases because many of these animals are capable of bioluminescence and can light up if disturbed at night. Finally, because they are nocturnal, they are obviously not photosynthetic, so they do not care about the lighting in your tank. Given that, they will also prefer an area that is shaded from direct light and they do not tend to thrive in areasof intense flow. Without any symbionts, these animals obviously need to be fed regularly to survive. As I mentioned above, all available evidence suggests that the tube anemones found in the hobby probably feed on small zooplankton and organic detritus. If you have a well-developed deep sandbed with lots of critters and/or a refugium design for your tank (especially if you develop a good culture of amphipods, copepods and mysids) they should do fine with this constant food source. Periodic additions (say twice a week or so) of krill, frozen or live brine shrimp or chopped fish or shrimp just to make sure that the animal is well fed will ensure your animal stays healthy. However, if you don’t have a dense population of various ‘pods in your tank to provide a nocturnal food source for your tube anemone, then you’re going to need to feed it well if you expect it to survive. Given the way that these animals eat in the wild, frequent small feedings are definitely preferable to occasional large ones. Ifyou lack a dense plankton population in your tank, or if the animal is first becoming established in the tank, krill soaked in Selcon should be offered nightly to keep the animal healthy. However, feeding turns out to be easier said than done for many animals because when their tentacles are touched by anything large, they immediately pull back into their tube. That makes it pretty hard to drop a piece of shrimp or fish on them, so make sure that the portions you offer are small and frequent. Although it may take a serious effort on your part to ensure that they are well-fed and healthy, by floating a few enriched brine shrimp or soaked krill into the tentacles each night, the animal should thrive. Haywood M, Wells S (1989) The Manual of Marine Invertebrates. Tetra Press, Morris Plains, NJ.